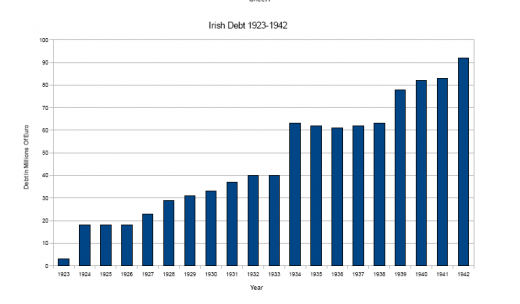 In the light of Ireland’s current debt crisis, John Dorney looks at the fiscal history of the Irish state since 1922. Debt crises are nothing new in Ireland. Indeed, one could go back as far as Jacobite state’s bankruptcy in 1689, when James II’s supporters had to melt down cannon to produce more brass coins. This article however, will confine itself to the borrowing and debt history of the Irish state, south of the border since 1922. The polity known initially as the Irish Free State and since 1948 as the Republic of Ireland has had three major episodes of debt crisis since its foundation. The first came right at the start in 1923-24, when the costs of, and damage done by the Civil War very nearly crippled the new state at birth. The second was a long drawn out period of rising debt and huge public borrowing that lasted roughly from the late 1970s until the mid 1990s. The deficit here was caused in part by the world oil crises, but to a much greater extent by very large increases in public spending designed to trigger economic growth. When the economy did not grow as expected, public finances were left with a massive gap between what they spent and what they took in in taxes. Repaying this debt and even the interest on repayments placed a huge burden on Irish taxpayer throughout the 1980s and had a lot to do with poor economic performance and massive emigration of that period. There have been three major periods of financial crisis in independent Ireland. In the early 1920s, throughout the 1980s and from 2008 to the present. The third fiscal crisis of independent Ireland, as most readers will be well aware, is at the present (2008 onwards), when the state’s finances have fallen steeply and traumatically from a position of surplus to a crushing deficit. There are two principle and linked causes for this. The first is the assumption by the Irish state of the private debts of the Irish Banks in the autumn of 2008 in an effort to avoid their collapse. The banks had bet heavily on loans to property developers and had lost. Much of the Irish economy and public finances had also depended on the property market and its collapse at roughly the same time as the banking crisis, sent shudders throughout the Irish economy. It also meant that revenue collected by the state fell radically. The result has been that Ireland can not borrow money at realistic rates and has been forced to accept loans, with attendant conditions from the International Monetary Fund and the European Union. The above summary seems to imply that the Irish economy was, after a rocky start, well run apart from two bouts of financial collapse in the last thirty years – resulting in the end in a real blow to Irish fiscal autonomy. This is, however, quite misleading. Public debt consists of the state spending more money than it takes in. It can be solved by either the economy creating more wealth or by cutting expenditure. For much of the Irish state’s first four decades, the state invested little – compared to European countries of comparable size, Denmark, for instance – in things like education, health and social welfare. The main reason for this, apart from a very real social conservatism in Irish politics, was the poor performance of the Irish economy compared to other western European countries of similar size, population and levels of development. While the state’s finances may have been prudently managed, Irish income per capita, among the highest in Europe at independence, fell far behind neighbouring countries by the 1950s. Emigration soared to the extent that senior Irish politicians in the late 1950s were talking seriously about the potential failure of the independent Irish state. By total contrast, since the 1990s, Irish standards of living of have caught up with, and even for a time surpassed, other European countries. In parallel, since the 1960s, but especially in the last 20 years, public provision of education, health and social welfare have been gradually put together in a way that is at least comparable with welfare states elsewhere. In short, intelligent investment of public resources since the 1960s has produced far better results for Irish citizens than the extreme fiscal conservatism of the state’s early decades. What the Irish experience of the 1980s shows is that spending and borrowing can not be a substitute for real economic growth, on which state investment on social and infrastructural projects ultimately depends. This article will track the fiscal policy of the Irish state since 1922, paying particular attention to the three periods of financial crisis outlined above. The funeral of Michael Collins in 1922. Bankruptcy almost buried the Free State as well. A great many former colonies arrive at independence through violence, but not too many start out fighting against the very people who have brought them into being. 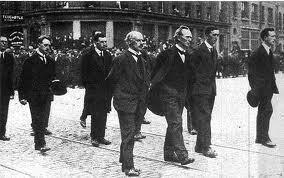 Such was the case in Ireland in 1922-23, as pro and anti-Treaty factions of the nationalist movement came to blows. The Civil War, limited though it was in terms of scale and lives lost, did very serious short-term economic damage to the state. The anti-Treaty IRA had a deliberate policy of wrecking infrastructure such as roads, railways and government buildings in order to bring down the civilian administration of the Free State. On top of that, the new government had to pay for an army of some 60,000 men. By way of comparison, the current strength of the Irish Army is about 8,000. They also had to house 12,000 prisoners and to pay 27,000 dependents’ allowances. Where there was sustained armed resistance to the state, in for example, Kerry, Tipperary and parts of Cork, taxes could not be collected at all. County Clare, for instance, alone had a tax shortfall of £200,000. Out of a total expenditure in 1923-24 of about £30 million, £10.5 million was spent on the Army. By 1926, it was calculated that the cost of the war, including re-building, compensation and financing the Army came to £47 million, or roughly 170% of the state’s annual income. The Irish banks, most of whom then had their headquarters in London, were reluctant to loan money to the Free State until they were sure it would survive. It took WT Cosgrave, the new Prime Minister’s, personal relationship with Bank of Ireland to rescue the finances of the new state. The Bank’s large (though undisclosed) loan to the exchequer staved off bankruptcy in 1923-24. The only positive aspect of the financial situation was that once the Civil War had concluded in victory for the Free State, spending on the military could be radically cut. As Cosgrave put it in April 1923, “The anticipated deficit for the coming year is no doubt serious but it is not such as to cause any misgivings as to the financial future of the Free State…a large amount of the expenditure is non-recurring and …on the arrival of settled conditions the revenue of the country will be ample to cover all commitments”. The new government, on the whole a fiscally and socially conservative group themselves, inherited a British-trained civil service, schooled in fiscal rectitude. A senior British Civil Servant, CJ Gregg, was loaned to the Free State to oversee the setting up the Irish Department of Finance, urging the need to, “impress on people that one Minister holds the purse strings and … it is very difficult to get anything out of that purse”. The deficit caused by the Civil War was serious but manageable. However it accentuated the extreme financial conservatism of the new state. The first Minister for Finance, Ernest Blythe, as one of his first actions, cut the pay of civil servants and reduced government expenditure from 42 million in 1923 to 28 million by 1926. At the same time, income tax was reduced from 25% to 15%, less than the rate in England. Blythe, his colleagues and senior civil servants, such as James McElligot, saw their role as running a tight financial ship and facilitating trade, not intervening in the economy. The Minister for Labour, Patrick McGilligan stated in 1924, “It is not the function of the government to provide work”. Taxation remained low as did spending. This attitude would endure in the Department of Finance well into the 1950s. Nor should it be imagined that this was the product simply of the Civil War counter-revolutionaries of Cumman na nGaedheal. In 1932, Sean MacEntee, the first Fianna Fail minister for Finance said, “no authority would attempt to justify borrowing to provide services like public works and buildings, grants to universities”. Although absolute debt increased, after 1924, it remained small as a proportion of GNP. The jump after 1932 reflects Fianna Fail's greater investment in social scheme and in industry. Thereafter Ireland remained a creditor nation until the 1970s. However there was a cost to this financial discipline. There was little state investment in this period in the provision of health, education or social services. This compares unfavourably to, for instance, Denmark which had 30% higher tax than the Free State and which borrowed heavily to invest in education and in infrastructure and as a result, grew its economy faster and more equally. Fianna Fail, after coming to power for the first time in 1932 on a populist platform did invest in public housing and state pensions and domestic industry to a greater degree, but under Sean MacEntee as Minister for Finance, the Irish government retained what has been described as a “phobia” about borrowing. We tend to think of Ireland as being historically a poor country, but at independence it was no poorer than most other countries in Europe. 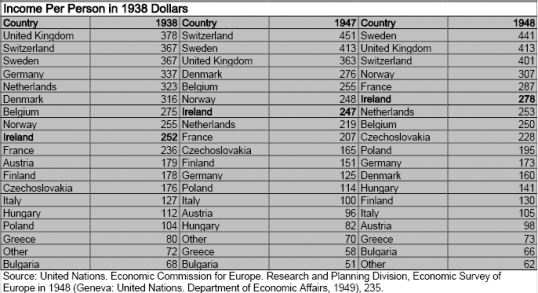 Indeed in 1938, annual income per person in Ireland was estimated $252, the ninth highest in Europe, behind the UK, Germany and the Scandinavians but ahead of such countries as France, Austria and Italy. At independence income per capita in Ireland was ahead of such countries as France, Austria and Italy. In the 1950s Ireland fell well behind. Certainly wealth was not evenly divided and most people faced hard times in the 1920s and 1930s. In 1932, 1% of the Irish population owned 59% of its wealth, while 8% owned 34% and another 10% owned 37%. The remaining 81% had no taxable assets, or bluntly, had no disposable income above subsistence level. Some 75,000 people emigrated, mostly to the UK, every year in the late 1930s. However the 1930s was a hard decade in many other countries. Ireland was also spared the devastation of the Second World War. According to Sean Lemass, who took over as Taoiseach in 1959, there was a possibility of an imminent failure, not only of Irish economic policy, but of the Irish state itself. Something, “has got to be done now…If we fail everything else goes with it and all the hopes of the past will have been falsified”. There is not space here to go into detail on the changes in Ireland’s economic policy in the late 1950s and early 1960s – but suffice to say under Sean Lemass as Taoiseach and on the advice of T.K. Whitaker as Secretary for the Department of Finance – specific plans for economic growth were set out – including planned investment in industrial infrastructure and, most significantly, the dropping of many protective tariffs and giving tax incentives to foreign manufacturing companies to set up in Ireland. The economic plans of the Lemass era managed to jolt the Irish economy into growth of 4% a year between 1959-1973. A result of having more public revenue was the belated investment in social infrastructure. Emigration fell as living standards in Ireland shot up by 50% and began to catch up with the European average. However, as living standards rose, and with it both prices and expectations, so did public spending – eventually to an unsustainably high level. Government spending in the Lemass period rose from 21% of GNP in 1958 to 24% in 1966. The public debt rose slightly from 4-6%. From the 1970s, National Pay Agreements between the government and unions resulted in ever higher rates of pay for public servants (up, for instance, 30% in 1974) often financed by foreign borrowing. By 1971, TK Whitaker, now Chairman of the Central Bank, was warning of the risks of continuing the spiral in public spending. Not all of this was the fault of either irresponsible governments or of intransigent unions however. The oil crises of the 1970s, where the oil producing countries of the middle east withheld supply of petrol, caused massive inflation and union action for wage increases was in large part about maintaining their members’ real income. To pay for public wages keeping pace with inflation, and also for the newly established social welfare, Irish budget deficits jumped from £20.4 million in 1973, or 0.4% of GNP, to 187 million in 1977, or 3.6% of GNP. By that year, Ireland had a foreign debt of £313 million. However, what triggered the second debt crisis in modern Irish history was not just the oil crises or inflation but the spectacularly ill advised policies of both Fianna Fail and coalition governments in the late 1970s – which tried to reactivate the economy by increasing public spending, which by 1981 was fully 65% of Irish GNP. 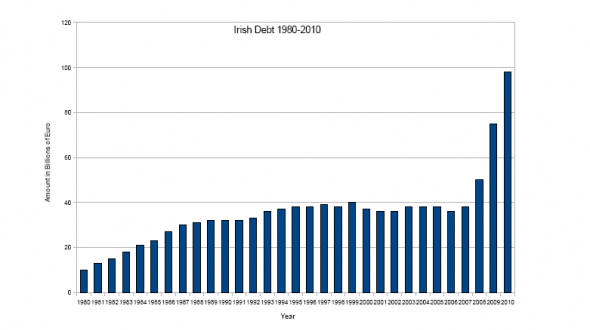 Irish national debt in 1980 was £7 billion or 81% of GNP. 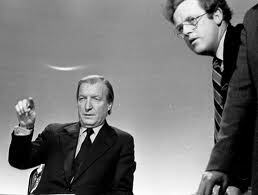 When Charles Haughey declared in 1981, “We are living away beyond our means”, he was doing no more than stating plain facts. In recent years, it has been commonplace to voice outrage at the hypocrisy of Haughey’s statement – he himself lived an opulent lifestyle based on semi-legal donations from business people. However, what was much more serious in the short term was his failure to solve the problem by adequately cutting public spending. With 3 elections in 2 years it was too politically risky. This was quite unlike the debt crisis of 1923 in that much of the debt was incurred through everyday spending on the public sector, health and social welfare and therefore increased every year. The result of this was cripplingly high tax rates of between 35 and 60% of wage earners’ income. As in the 1950s Ireland’s social pressure valve – releasing otherwise potentially explosive discontent – was emigration as, again around 40,000 people left the country annually. Unlike the 1950s, which was crisis of low growth, the 1980s crisis was in large part contributed to by reckless spending and a suffocating public debt. Economists may disagree on what factors exactly converged to get Ireland out of the financial and economic mess of the 1980s but essentially there two factors involved. One was growing the economy by attracting foreign investment. This was done by offering very low taxes on profits (corporations taxes which were set at 12%) and by investing in education – offering a well educated work force at relatively low wages and access to the now-open European market. The second factor was getting public spending under control by a series of agreements, termed ‘social partnership’ with the trade unions – where gradual increases in pay were awarded in return for no industrial action. The Irish economy began to grow and the national debt came down. However it was not until the second half of the 1990s that figures for unemployment and emigration were reversed. The population grew to an all-time high for the state of about 4.5 million. By 2000 Ireland had a handsome budget surplus and the first decade of the new millennium also saw a significant expansion of public spending on infrastructure and social services. As against this, several state-run industries were also privatised – Eircom for instance. In 2002, Irish national debt was 32% of GNP and fell further until 2007. The crash of 2008, like the oil crisis of the late 1970s, was an international economic malaise that hit Ireland particularly hard. Banks across the world had been reckless with their lending but the Irish banks were particularly exposed. They had borrowed from other banks, mostly in the EU, to lend money to property developers who, it was now clear, could not pay them back. The Irish government, from 1997-2007 of Fianna Fail under Taoiseach Bertie Ahern, bears some of the responsibility for this, for in the first place encouraging unsustainable investment in property development through tax breaks for developers and secondly failing to oversee adequately the lending policy of Irish banks. The Irish government of 1997-2007 bears some of the responsiblity for the current crisis. 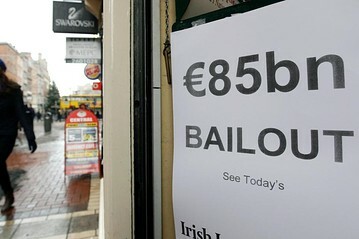 The Irish government, following a late-night meeting with all the senior banking officials in the country on September 30 2008, agreed to cover all of the banks debts. This debt, now estimated at over €50 billion, (over half of which will be paid to Anglo-Irish Bank, a particularly reckless lender) hangs like millstone around the neck of the Irish economy. The second problem is that public spending, which rose steeply in the 2000s, was now unsustainable. The total Irish budget deficit as of November 2010, stood at 93 billion or up to 120% of GNP. As it was not clear how much money would be needed to revitalise the banks – to clear their debts and supply them with enough money to start lending again – the international markets were unwilling to lend Ireland money at an interest rate it could afford. Under pressure from the European Union, which feared a ‘run’ (selling causing a collapse in value) of the euro, Ireland was forced to accept a 16-year loan of €85 billion at just under 6% interest from IMF and EU itself. The IMF delegation in Dublin, December 2010. In absolute terms, Ireland’s current level of debt is unprecedented. On the other hand, Ireland’s economy is also much larger than it was either in the early 1920s or in the 1980s. 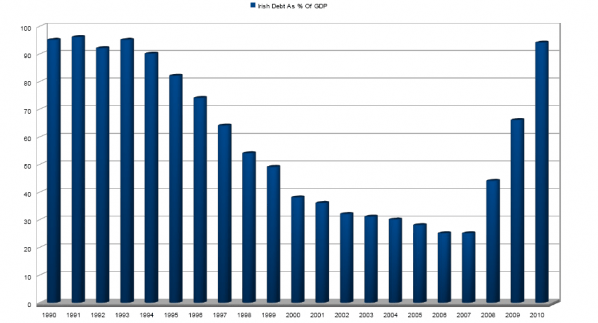 As a proportion of GNP, the debt crisis of the 1980s was even worse than the present. The burden borne by the Irish citizen in earlier periods was also much worse – in the first decades of independence in terms of a lack of basic social services and in the 1980s in terms of punitively high tax rates. However, in one respect the current crisis is the worst in that the state has converted an enormous debt accumulated by private enterprise – the banks – into public debt. There is no straightforward comparison for this in the state’s history. What is so problematic about this is that it is not clear whether this debt is a hole which can ever be filled. *Dunphy Richard, The Making of Fianna Fail Power in Ireland 1923-1948, Oxford University Press, 1995. * Giblin, Thomas, Kennedy, Kieran, McHugh, Deirdre, The Economic Development of Ireland, Routledge 2002. *Hout Michael, Following in father’s footsteps, Social Mobility in Ireland, Faber & Faber, 1989. *Lee, JJ, Ireland Politics and Society 1912-1985, Cambridge University Press, 1993. *McLaughlin, Eugene, Ireland from Catholic Corporatism to Social Partnership, in Comparing Welfare States, Allan Cochrane, John Clarke, Sharon Gewirtz (Ed.s), Bonhill 2002. Department of Finance figures of Capitalisation of Credit Institutions, September 2010. Written by: John_Dorney on 25 January, 2011.on 30 May, 2012. 21 Responses to "Life and Debt – A short history of public spending, borrowing and debt in independent Ireland"
To sum up this topic in such a short space is pretty impressive I have to say! This is great stuff John. Cheers Conor! Always enjoy Dublin Opinion. Excellent and timely, a full roadmap of how we got to be “where we are”. Your analysis of events I know of is fair (though the accusation of hypocrisy against Haughty should stand given he fought an election against austerity, only to implement the cuts he complained of). Only problem I have is I can’t make the figures on asset ownership in 1932 add up. Hi Cathy, Haughey was hypocrite personally in any number of ways but the point I was making was that by any objective standards, cuts in spending were unavoidable. Re the 1932 asset figures, I took them from Richard Dunphy’s, “The Making of Fianna Fail Power”, p 164. Tom Johnston, the Labour Party leader assembled them in the late 1930s by using the estate duty figures of 1932-33. According to his calculation, the 81% owned nothing over 100 pounds in cash or goods. Thanks for your comments on the article by the way! To sum all of this up in a nutshell, the Irish fiscal situation has been horrendous since way before mentioned and without going into the political charade involved with the whole thing…….only people who have suffered all along and through out history in Ireland ve been the hard workers of Ireland , and again i am not mentioning obviouslywho these people are but will know themselves! The whole thing is laughable in my mind. I’m not sure that would avoid the creation of public debt. Though if it were forced to borrow only from citizens it would almost certainly need to force those citizens to lend to it. If what you are advocating is in effect a a balanced budget then at times the government would be required to savagely cut expenditures (and to do so at exactly the worst time) in order to balance its books. A good analysis. I would take issue with describing the civil war as unusual. Almost all post colonial countries had a civil war of some sort as factions struggled for power. I believe Ireland to be unique in voting the losing side into power so quickly afterwards. The Irish Free State changed its name in 1937. It did nothing in respect of its name in 1948. Ireland is not a former colony. It seceeded from the United Kingdom of Great Britain and Ireland. It’s the only state that has ever done so. Corporation taxes were set at 12.5%. I agree with the others, really good piece. Very succinct too. Thanks. I’m sure it’s quite dated now, it was written in 2011. Regarding the colony question, technically that is true, but Ireland was governed quite distinctly within the UK, more as a colony than an integral part.